... the wild weather will ruffle your feathers ! ... has helped all summer with my garden tasks. Is this a new fledgling? As far as I can tell, this is an adult growing new plumage, after a heavy moult caused by parental duties back in the springtime. Brilliant capture Terra! You could enter this in the Countryfile competition, it's gorgeous! that's gone straight into my favourites! wonderful pic, well captured indeed. Hope the moult doesn't last very long. my word how adorable :-) lovely image TT. @ TT, how close were you for this pic? Great picture TT. Lots of the birds in my garden are moulting at the moment, I keep finding discarded feathers. Gosh looks to have been out in the wind and rain! His feathers look fashionably ruffled and a quizzical expression on his face. Lovely photo of a rumpled robin. I have noticed in the past few days that there is a baby robin flitting about at the end of our garden & he always appears when I go up there. 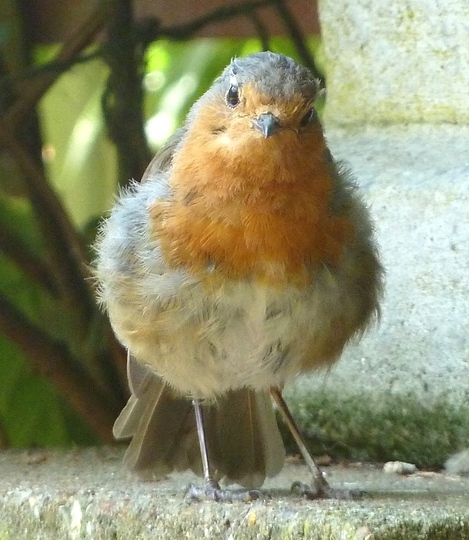 He seems quite tame but I haven't been feeding him as I did another robin family a couple of years ago. I wonder if he is from the same family stock & word has filtered down to him on the Robin grapevine that I am an easy touch!! I don't want to encourage this one too much though because now we have the cat 'Willow' I wouldn't want her to catch him!! I did put a handful of porridge oats near where he appears though - hope he enjoys that & hope that Willow won't see him! but they keep up off the ground. My favourite visiting cat Spooky was lurking under the feeders gazing at 2 gold finches feeding about 3 feet above her head. After all the mayhem in the garden of bird killing this year=2 newly fledged blackbirds beheaded by magpies, a newly fledged pigeon by a cat. Then a sickly, lame baby woodpecker fell out of a tree, dead. I used my new long syringe like squirter to gently hint to Spooky to move on. She flew like the wind along the back fences. What a delightful capture TT a great Chr......!! card material!! Thanks for the lovely comments ..
... cats avoid my garden ... I guess because they know there are dogs in residence ! loss of internet and phones ..
Just love it, TT......feel you could cuddle him or her!!! !